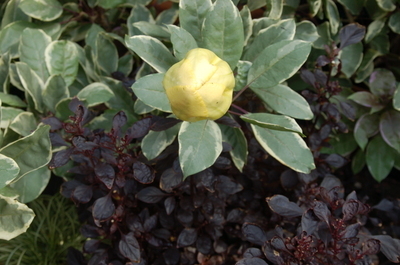 is just about to push open this big bloom and, for color, the Iresine 'Brilliantisima' knows no equal! 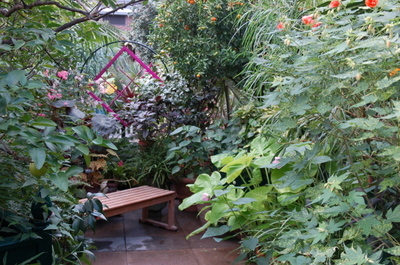 There are several little nooks created for sitting and enjoying the surrounding beauty. 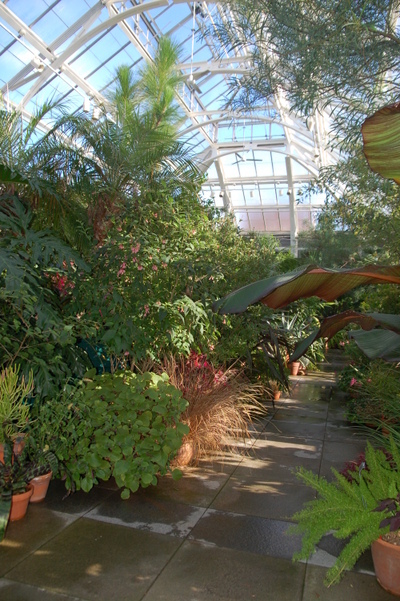 These are created by the walls of tropicals and are arranged such that you feel you are sitting in a private garden. 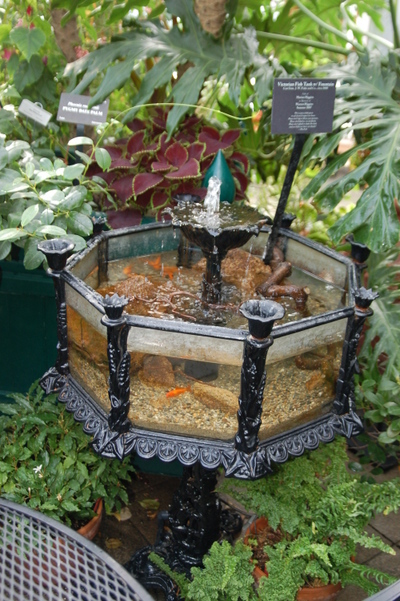 This nook is complete with this victorian aquarium. I have never seen one before and this one must have been quite the find! 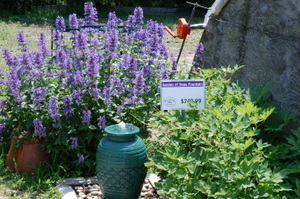 The little sign indicates that it was a donation in memory of someone's beloved and the tank itself is circa 1880. 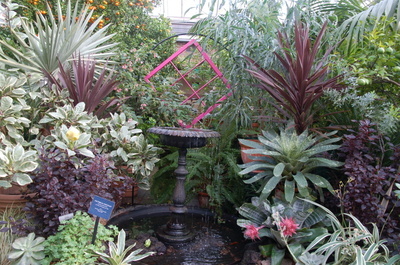 Water has a presence in this space and the trickling sound of this fountain and its' twin can be heard throughout the conservatory. 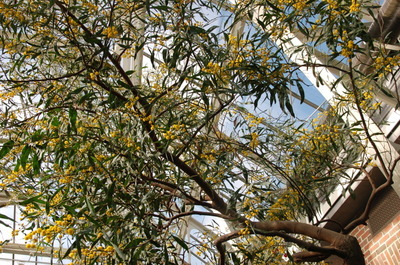 Overhead, the Acacia blooms profusely adding its' bits of sunshine to the glass enclosure. It is a spirit lifting experience to stroll through this man made ecosystem but, unlike the fish swimming unconcerned in their little tank, one must eventually step out of paradise and back into the harsh reality of a cold January day. 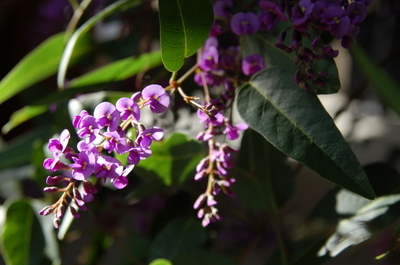 The lingering memory of moist warmth and bright flowers and foliage will help with the remaining necessary steps toward spring! Thanks for taking those steps with me. 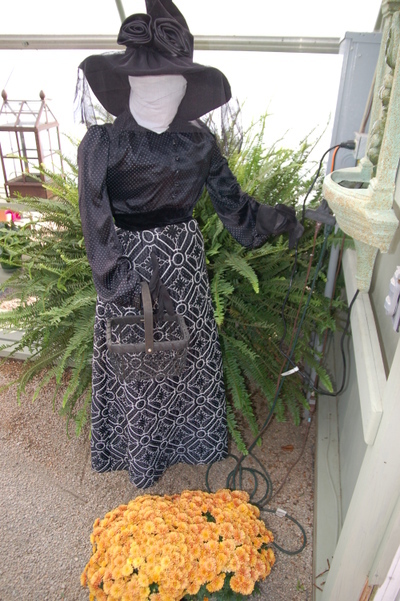 Spiders and Witches, pumpkins and gourds! 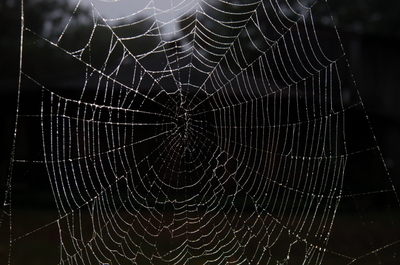 In honor of Halloween this spider web appeared in the garden. It was a few days ago but it does look spooky doesn't it? Woman. 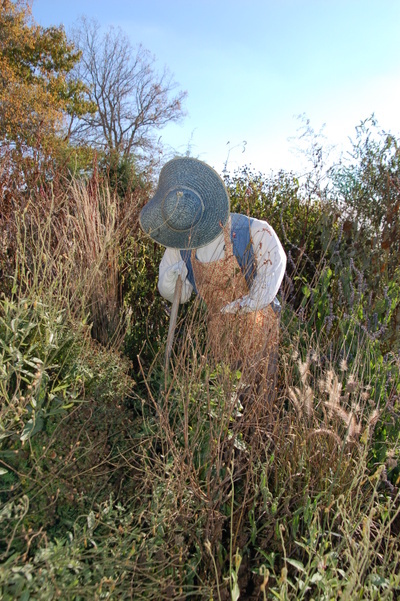 Next is her companion who seems to be losing the battle with the weeds! Here we have The Count. 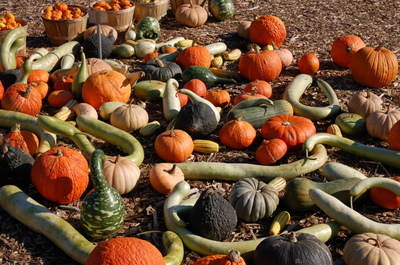 He is quite fashionable in his aubergine suit complimented by the surrounding pumpkins. Last but not least is 'The Widow'. She has a great hat! The field of pumpkins with all the tractors behind them is an interesting picture and the tractors will surely get the attention of the Equipment Manager and his fellow tractor lovers but sometimes the simplicity of just cornstalks and pumpkins is the most satisfying display! 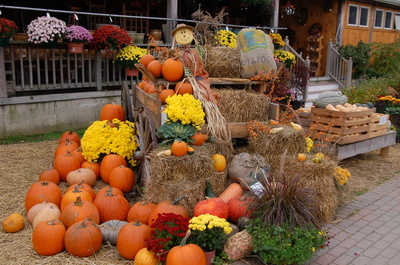 Happy Halloween to all of you! We are back with summer like temperatures today. 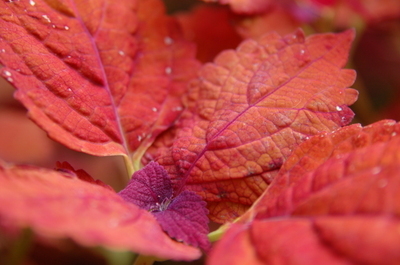 I hear that you cannot call it Indian Summer until after the first hard frost. 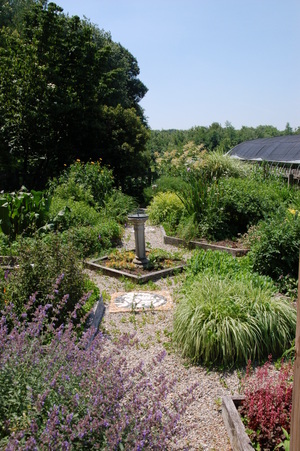 We have had a very light frost but the basil is still edible and while the annuals are looking shaggy, the grass is still growing! 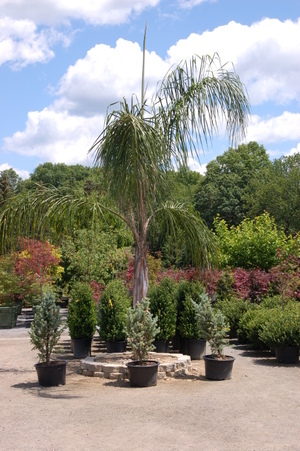 Last week in my travels I visited Cataldo Garden Center in Littleton, MA. 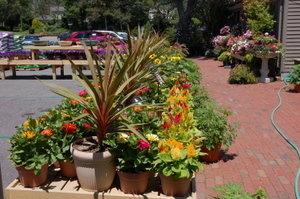 It is a full service garden center and gift shop with a great variety of products. I couldn't resist a couple of half price snapdragons and some white anemones. 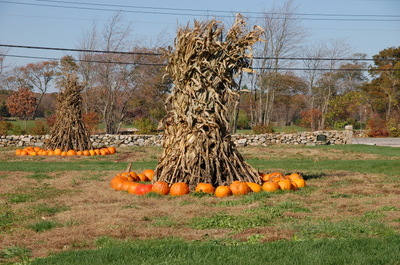 I did enjoy their October display.The display is pretty organic as you can see from these pictures. 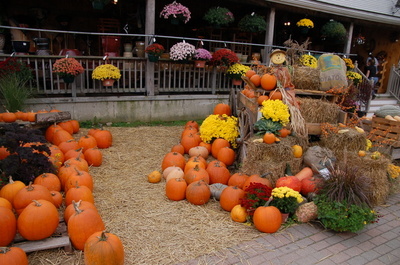 The mums are in full bloom and the pumpkins are aligned in a beckoning manner. 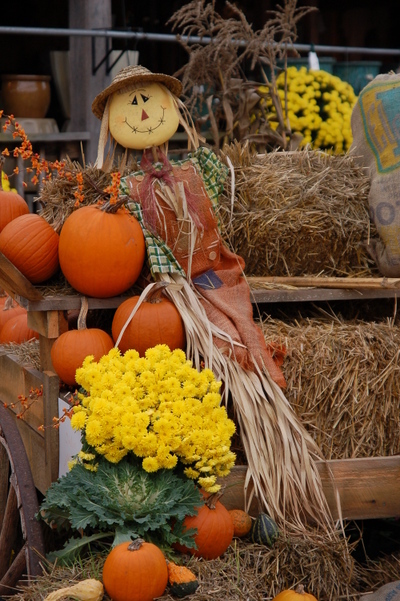 The scarecrow brings a smile to most faces. 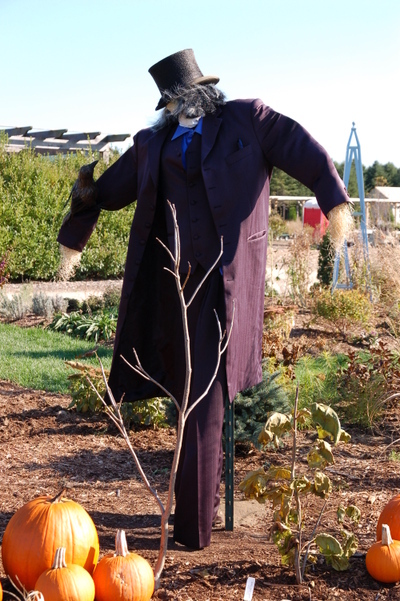 Who doesn't love a scarecrow...except the crows! In driving today I was struck by the many houses which are decorated extensively with goblins, ghosts, witches and that white cobwebby stuff. Lots of houses and some even have the huge blowup items which require a fan to keep them inflated. I wonder who has time for this not to mention the $$$ that could be spent on plants. Well, we all have our addictions but most of that stuff will just end up in the landfill won't it? I like the above decorations the best. 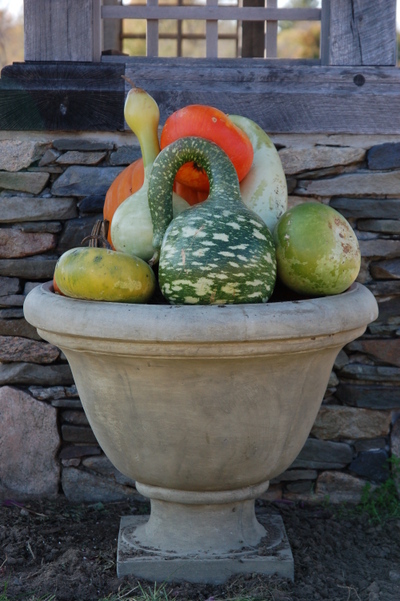 You can either eat them or compost them. 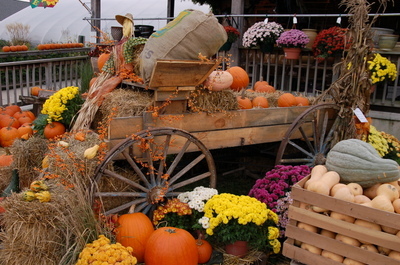 What do all of you do to decorate for the seasons? 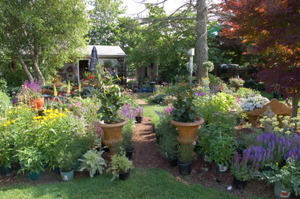 Today, I visited a garden center, The Good Earth, in Scituate, RI which is fairly close to my home. 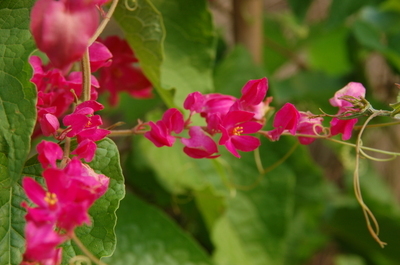 The owners are organic gardeners and they love plants, wildlife and salvia, not in that order. 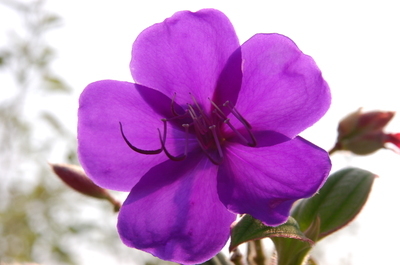 I took several shots of their plants and gardens and just wish to share the beautiful scenes with all of you. 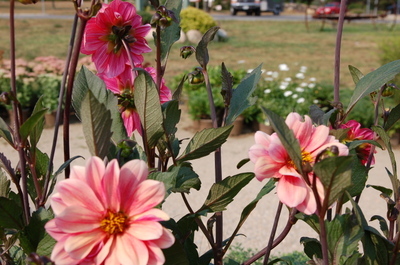 This dahlia exhibits multiple colors on one plant creating a very interesting addition to a container or planting. 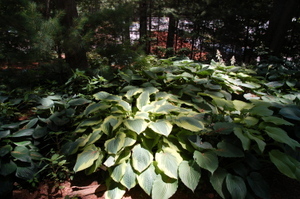 The foliage is very dark. Enjoy! 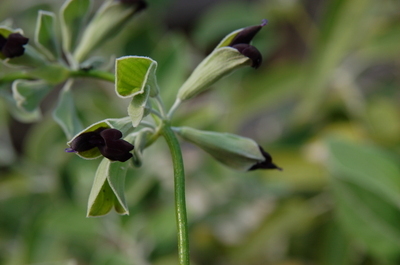 I last wrote a bit about Briggs Nursery in April but things have really blossomed since then. 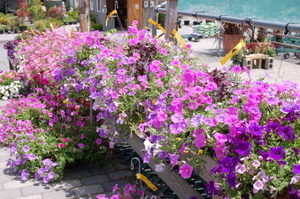 This garden center located in North Attleboro, MA has some of the nicest displays around. 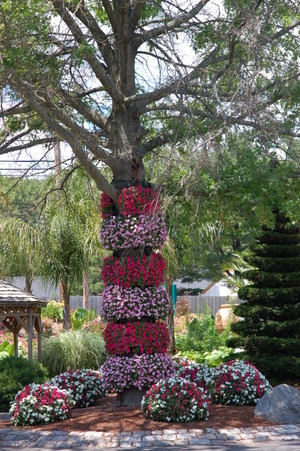 Check out this annual tree! 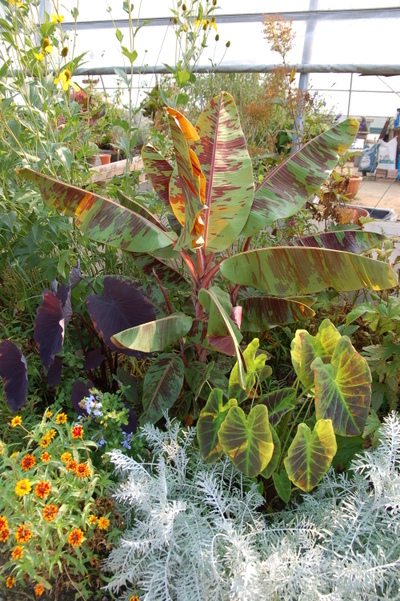 In the background you can see the palm trees which are imported each year for the roadside garden. They are quite a conversation piece in this zone 5 - 6 area. 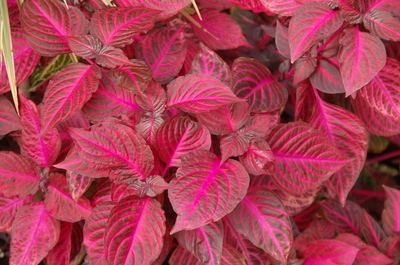 As you can see, the front is full of color. 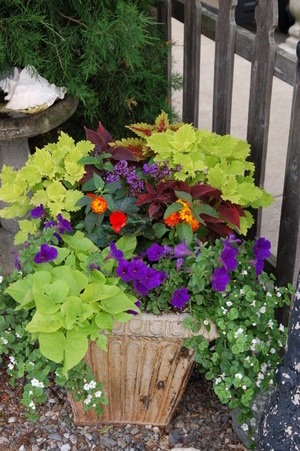 I know that yesterday I said I really preferred the 'hot' colors such as the first picture and this display but after seeing these containers which are used as edgings and barriers, I might change my mind! 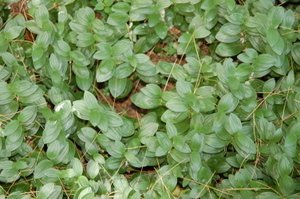 and other shade loving plants such as this variegated pachysandra, the always elegant European ginger, and this little Solomon's seal groundcover. 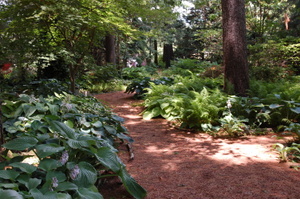 The shaded walk in this garden invites you right in for a stroll among some very large and varied hostas and then the path leads you right back out into the sunshine. Today was a day to be traveling in an air conditioned car or working in an air conditioned building. Not so for the garden center workers. 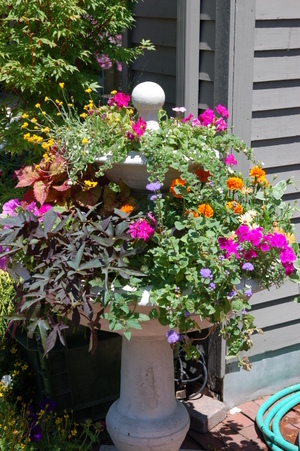 They must endure the heat and spend most of the day watering. 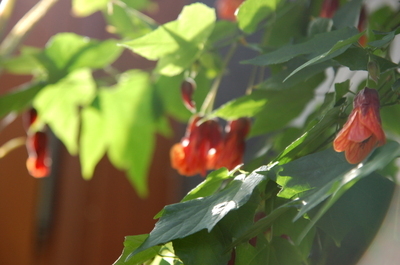 Plants respond to heat stress by drooping and people pretty much do the same. 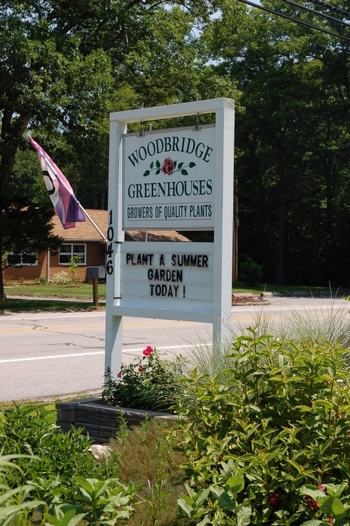 In my travels today, I stopped at Woodbridge Greenhouses. 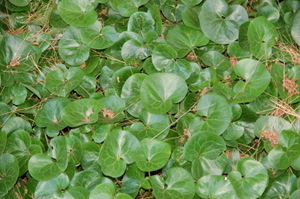 The name is derived from the dense glacial til which is called woodbridge soil. 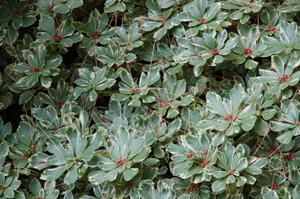 This soil was deposited on smooth top slopes or upper side slopes when the glaciers receded. 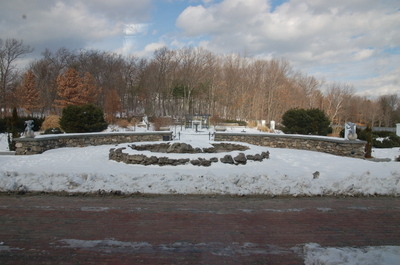 Woodbridge Greenhouse is indeed on a hill not far from the highest point in Rhode Island which boasts just over 900 feet. Not too impressive is it? But keep in mind that this is the Ocean State and height is always relative. 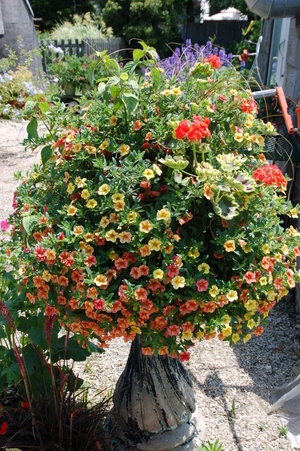 The owner and grower is a friend, customer and great grower! 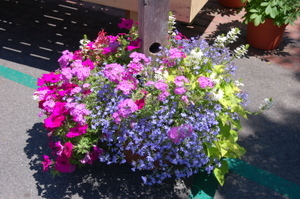 There is always something interesting to see at this small and delightful garden center. 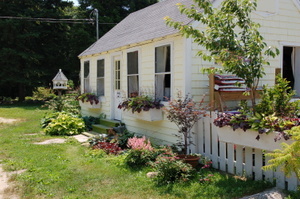 It has a small office located in an old house which is painted butter yellow with lime green steps. 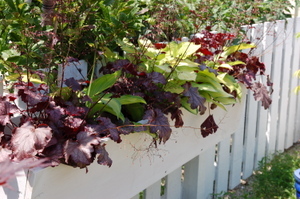 The window boxes are adorned in my favorite shades of burgundy and lime green. 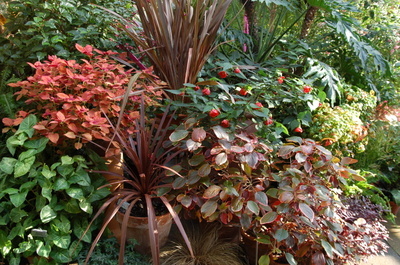 The nursery yard is well appointed with shrubs and filled pots. Why is there no picture of the nursery yard? It was hot and I guess I missed that shot. 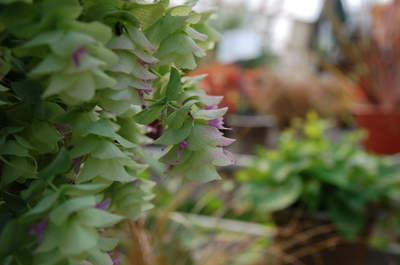 At the corner of one of the greenhouses is this inviting water feature with this great nepeta in the background. 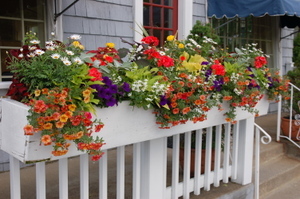 There is a display garden enclosed with a picket fence. 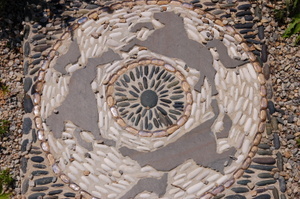 It has some very intriguing stepping stones which were made by a local artist. There are three different ones. One with horses, one with fish and one with dragonflies. Very interesting! Did I leave without purchasing? Not this time. Here is the booty! 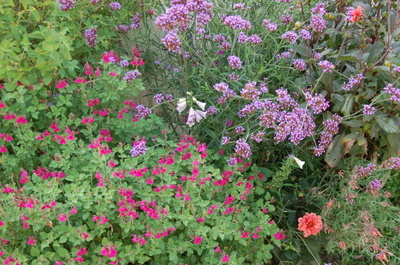 The weekend clean out of the borders resulted in some obvious bare spots and we can't have that can we? 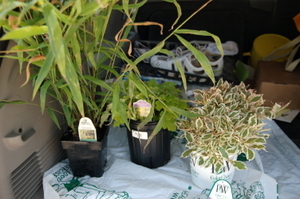 I bought this grass, Chasmanthum, Northern Sea Oats, Heuchera 'Lime Rickey' , and this Weigela, 'My Monet'. 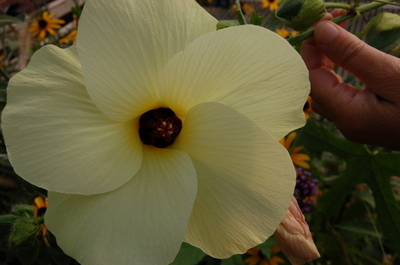 Have any of you grown any of these? What do you think of them? Today the schedule demanded a trip to visit some customers on the coast. 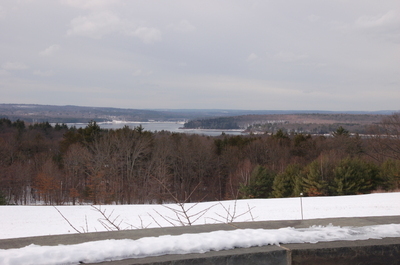 I know, that sounds like a long trip but in Rhode Island, even though I am as far inland as one can be without being in another state, it is only 35 miles, or so, away. I started my trek by crossing the Jamestown and Newport bridges and once through Newport, along the roadside in Middletown, I glimpsed the mule team pictured above. 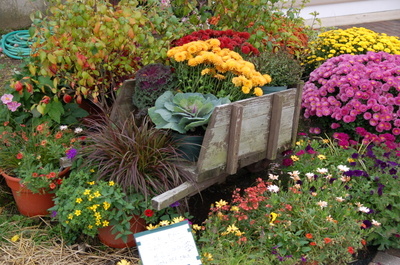 The mules are owned by Rhode Island Nurseries. 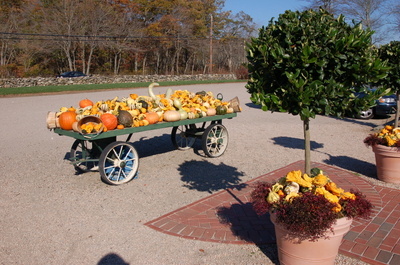 Rhode Island Nurseries is the oldest and largest nursery in the state. 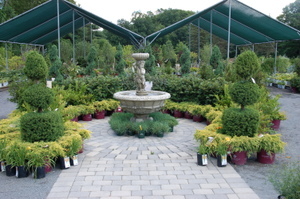 It was founded in 1895 by the Vanicek family and they are still operating it on 420 acres where they field grow ornamental shrubs for garden centers. 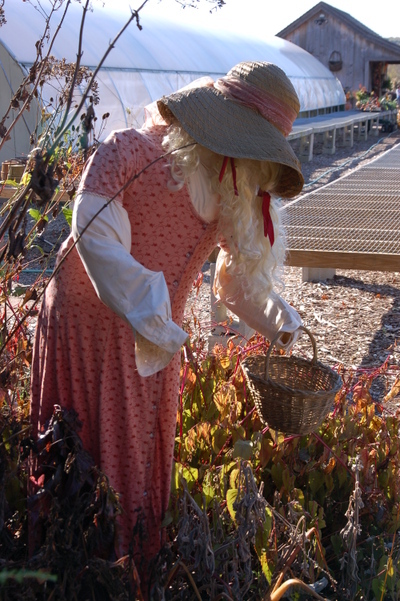 They use the mules for cultivating between the rows of plants. 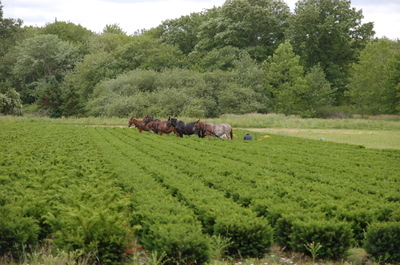 It is easier to use mules to work between tight rows as tractors are too wide. They do use some machinery where they are able but the mules are a tradition and a necessity. 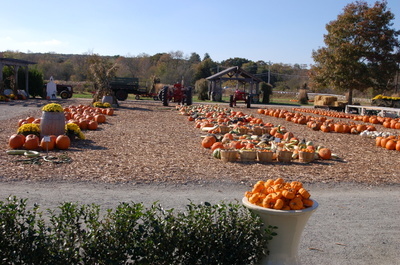 They use the manure mixed with grass clippings and wood chips to replace topsoil which is lost when the shrubs are balled, burlapped and lifted from the field. 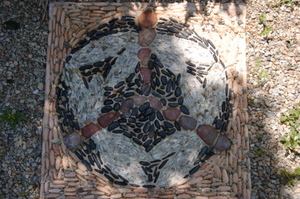 Sustainable agriculture! What a great idea! 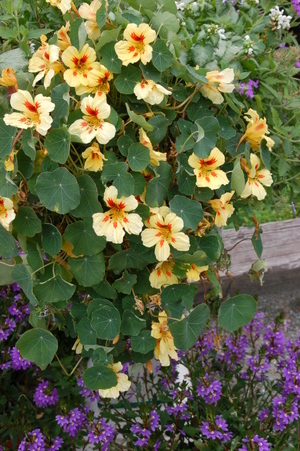 This nasturtium displayed in a container planting at Island Garden Shop in Portsmouth caught my eye. Of course they were out of this variety. Displays really help to sell product. As I crossed the Mt. Hope Bridge into Bristol I couldn't help but notice the whitecaps on the bay which was a hard steel gray. The wind was quite strong and the temperature was only about 55 F. Chilly and unusual for June! My biggest adventure of the day was visiting Gayle, Kris and Fred at Blithewold I have known Gayle and Fred for quite some time but had yet to meet Kris. 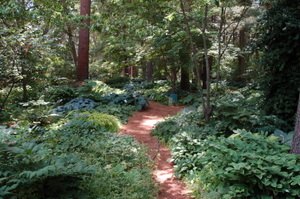 She writes a blog on the plantings and gardens at Blithewold which I have been enjoying for the past several months. I have been to Blithewold before but when you see it through the eyes of another's pictures and then in person the details stand out! Now I know right where the Chestnut Rose stands! 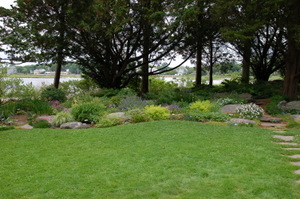 It is a magical property with 32 acres (I think) right on the water. 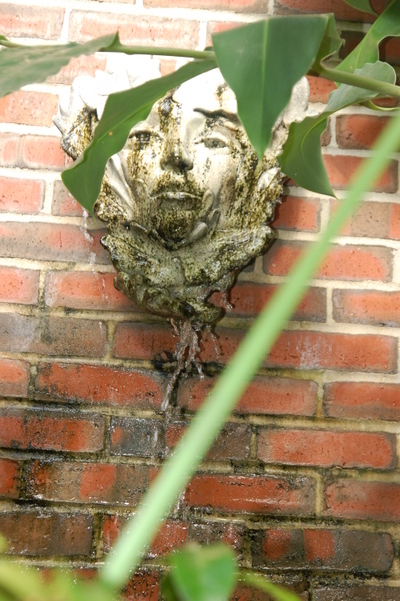 The grounds are meticulously and lovingly cared for as Kris relates in her blog. It was a real treat to actually meet Kris and to speak with her and Gayle-the highlight of my day! Day, I mean month! I know that she has many blogs to write and I don't want to take away from her future posts but here are a couple of pictures from Blithewold . It is an amazing place! 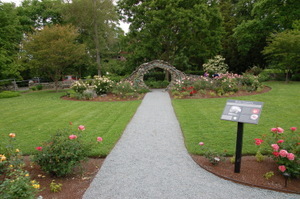 This rose garden smells heavenly! Click on picture to enlarge. 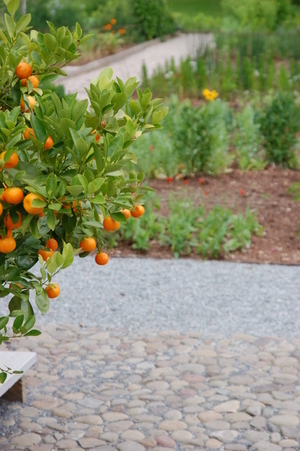 This picture has some wonderful paving detail in it so be sure to notice it although the focus is on the orange tree. 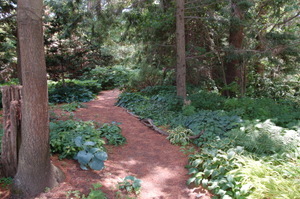 This next picture was taken on the woodland path of which there are several. 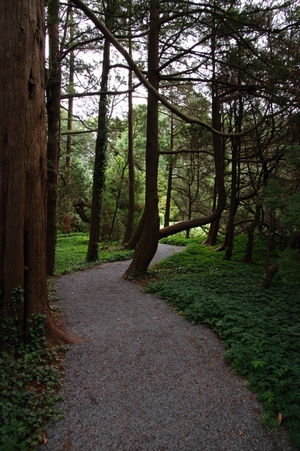 I love the structure and texture of the tree trunks. 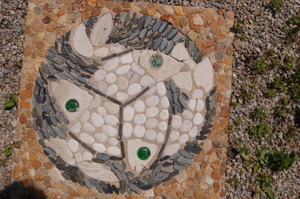 Okay, one more of the rock garden which is a surprise garden as it just seems to appear as you walk along a path. You can see the bay in the background in this shot. It would be no problem to spend more time here given the chance. The hard work of the staff is clearly visible in the pictures. I wish I could borrow the 'Deadheads' or the 'Rockettes'. Kris, can't you spare them just for a day or two? There is nothing like meeting a fellow blogger! I'll be stopping in again to say hello and next time I will bring pastry! Promise! 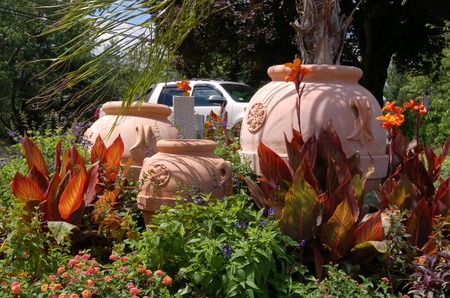 I did stop at one other small garden center called Hidden Gardens. 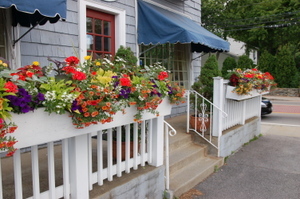 It is right on a main street but the parking area is tucked behind several buildings. 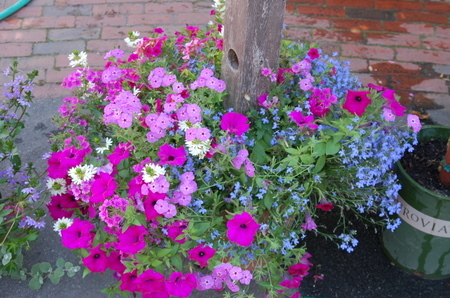 On the way into the parking area I took a picture of these neon planted window boxes created by the owner of Hidden Gardens. They are hard to miss. Here is a shot of the sales area. 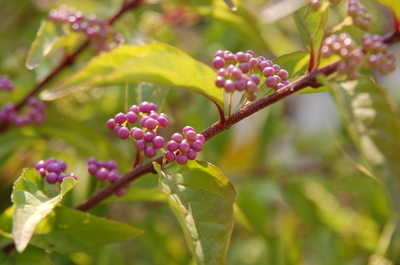 It is small but filled with explosive color. 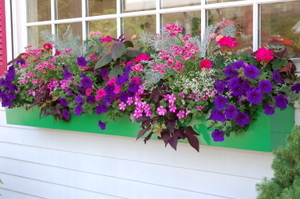 This window box was also done by Hidden Gardens for the ice cream parlor. Doesn't it look delicious!? Here is one last container. As you know, I love containers and am always on the lookout for those that are well dressed. I hope you have enjoyed today's journey. Thanks for coming along.